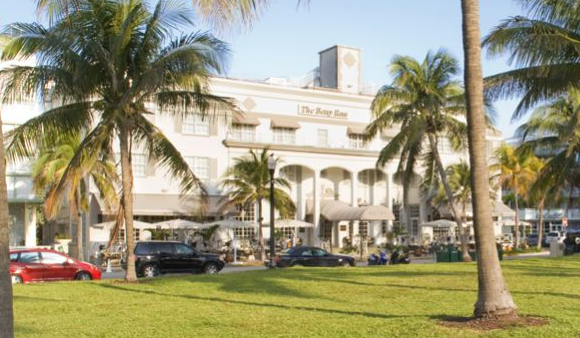 Sitting on the breezy porch of the Betsy Hotel on Miami Beach’s most famous stretch of road- Ocean Drive-this hotel is a standout structure with a colonial non-Art Deco look and an environmentally conscious green program throughout the property, something they’re proud to flaunt. It was added to the National Register of Historic Places in 1970 and this beauty deserves the recognition. While its traditional look is intact, it still has its South Beach touches. An inviting secluded courtyard pool beckons with an enclosed pool deck and plenty of amenities or there’s the rooftop retreat deck for unbeatable ocean views. Plantation style shutters, black walnut hardwood floors, walk-in showers, comfy custom built poster beds, and sunny colors make the suites and classic rooms an inviting place to relax and take in the views; staring at the swaying palm trees across the street and seeing endless ocean views is why they call this place paradise. And when it’s time to eat, BLT Steak is where it’s at, with delectable items prepared by award-winning Chef Laurent Tourondel, whose skills have been praised by both Bon Appetit and Food and Wine Magazines.